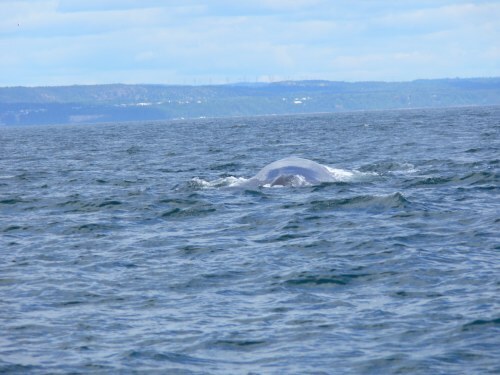 Our long awaited highlight of our trip along the St. Lawrence in Quebec was an exciting whale watching excursion. We stopped first to get some information about whales at the Meriscope Research Center where Danny Zbinden opened a biological research center several years ago to help marine biologists who wish to have hands-on, accessible experience with whales and related research. These programs are offered, sometimes with stipends available, seven to eight times each season, which runs from June until October. People interested in the research and study can come for two weeks and have accommodations, meals, seven or eight sea trips for up-close study and field work, and many talks by biologists. There are arrangements through three Universities for marine biology college credit for work here. 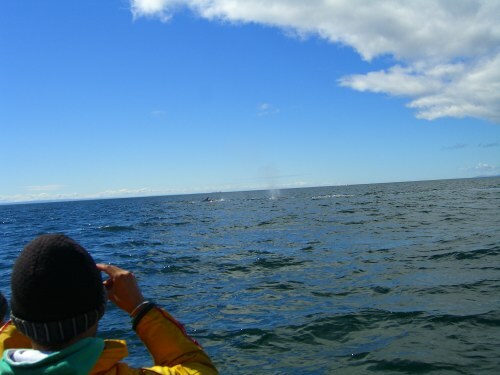 Others who are interested can come for one or two weeks just for the eco-tourism experience in nature, close to whales. Please see further information check at the address below. 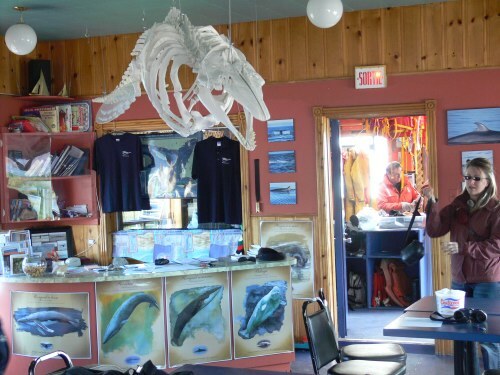 In Portnewf-sur-Mer is the Croisières du Grand Héron …THE place to go whale watching. It is owned by Yvon Bélanger. 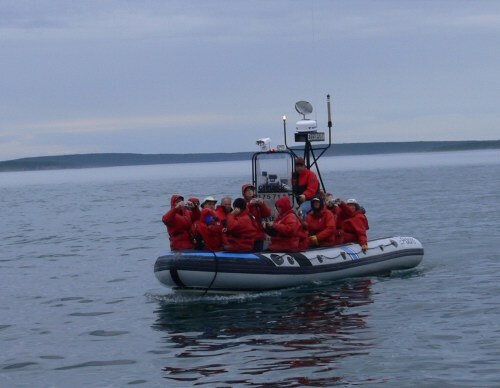 There are two excellent Zodiac boats for 12 passengers for whale watching in the huge St. Lawrence River estuary here, open June 1 till Oct. 15 They offer many daily departures for two-and-a-half hour tours or one daily five-hour tour. They also offer scientific forays with a biologist for conferences. Our two-and-a-half hour excursion was the experience of our lifetime! We had been on whale watching tours in five other places and never seen a whale, but here our excellent guide was in radio contact with other boats and each helped the others to know where whales were feeding. We were so lucky that this week there is plentiful schools of creel, attracting the whales to their preferred food, which is sometimes in short supply. 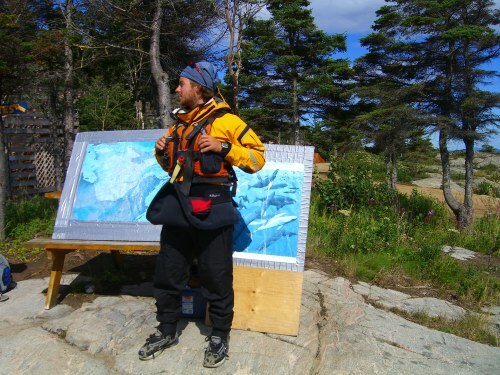 We donned the waterproof, warm suits the outfitter provided and which also serve as life preservers. 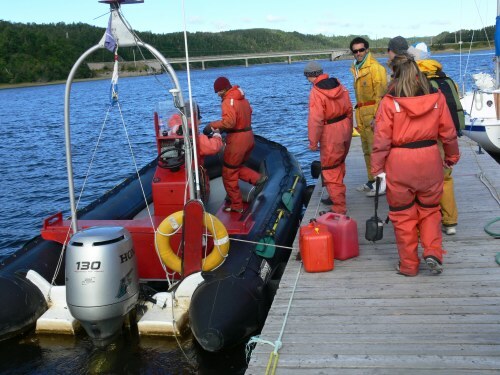 We were given warm hats and gloves, which were really needed in the chilly northern summer air with the boat speeding across the cold waters to the middle of the vast St. Lawrence, about 30 miles wide at this area. We sped to the middle of the mighty river and then the pilot cut the motor and we waited. 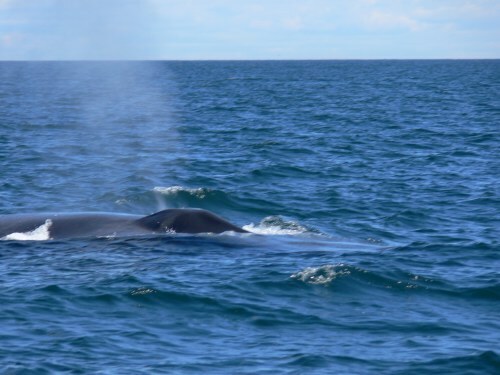 It was not long till five finback whales, the second largst of all whales, dived as if in formation on parade for us. We all cheered and were so excited. Just as we were calming down we heard a loud swoosh and looked behind us to see the tall spew from the blowhole of a huge gray whale. He announced his arrival so we wouldn’t miss him! I was a little awed by the fact that the whales were probably diving beneath our boat when they went down out of sight, but the driver assured us that the animals know how to watch out and certainly do not want to hit us anymore than we want them to. We rode around a bit further, watching spouting grays all around us and with the pilot talking to other boats. Then he announced that we should be on the lookout for the two blues that had been spotted in the area. We waited with cameras ready, and before many minutes had lapsed we saw both of them, the largest mammals on earth! What an opportunity, since the blues are rare in these waters in recent years because the creel have been scarce, and they only eat creel. 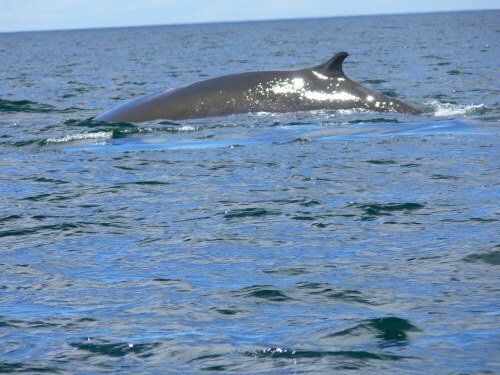 We saw many minke whales on our excursion also and were reluctant to return to shore when the time came. But most of us were ready to run to the bathroom, only to learn, after the fact, that there was indeed a small facility on the Zodiac for emergencies. Our tour continued to the new Maritime Adventure Park in Baie-Comeau 90 km away, and we cheered as the sun peeped out from behind the thick clouds. The Park is new and will have more features added through the years to enable day visitors, school groups, and family campers to experience the different periods of glacial impact on the terrain and to learn about marine life. Well designed trails through the great forests of the park are earth friendly, careful of low impact by visitors. Campsites are constructed in such ways as to preserve nature faithfully. The park is beside the powerful St. Lawrence waterway’, so teaching visitors about seals and whales and the myriad of birds is a natural. You can enjoy the coastal landscape from the Park Ranger’s boat and see the glacially cut rock formations with the footprints of the glacier’s passage, enabling scientists to study the formation of the earth’s surface in ways no other place provides. Upon completion of its final stage, the Glacier Garden will have four distinct unique areas for visitors to learn about different periods of glaciation and what how each period changed the maritime landscape and influenced its later inhabitants. At this wonderful park science and education are thoughtfully blended with exciting experiences in nature for visitors to remember forever the thrills there. Our favorite was a marvelous Tyrolean Traverse across the glacial fjord over inlet of the St. Lawrence. Although we knew the equipment is state of the art and is tested carefully each day, it is a bit scarey to get attached in harness and take that leap off the rock perch to start the quick traverse ride. But then zipping along the steel cable high above the water is like flying from the hillside across to the rocky shore. It is a soaring experience and what a thrill! If time had permitted we would have done it over and over. It was SOO much fun! In other places this is called a zip line ride. The Park also features a simpler Tyrolean Traverse for youngsters. We were impressed with both the educational emphasis and the safety measures taken in all areas of the park. Hiking there on the marked trails in the thick woods with sunlight glinting through tinting rich green leaves a sparkling silver, hearing many birds twittering above and smelling the fresh, clean, scent of the water’s breeze was an exquisite experience. We were fortunate that the beautiful sunshine held, so we enjoyed a delicious fresh seafood sandwich and excellent pizza at the nearby Mer et Monde Cafe, owned by Matthieu Dupuis and his father in law. They also own Mer et Monde Ecotours and a wonderful campground right on the flat rocks along the shore of the river, where you can be awakened in your tent by the noisy blow spout of a surfacing whale so closeby. Matthieu was in charge of our afternoon sea kayaking excursion. We saw many families setting up their tents for this all-night, up-close-to-the-whales-and-seals camping experience. As we were walking on the giant flat boulders of the shoreline we had an enormous thrill. Suddenly a large pod of white beluga whales swam past us just offshore. We counted 45 pairs as they dived repeatedly, their backs curving in C shape as the surfaced and immediately went under again. What a gift from Nature to see this unforgettable sight! 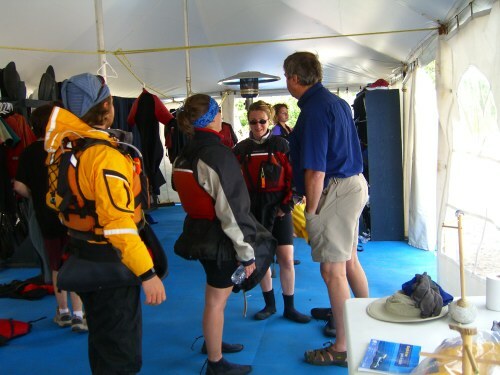 We donned our funny wetsuits with skirts to form the kayak seals and got aboard the crafts two by two. These are true sea kayaks, which are wider and longer than river kayaks and much harder to tip over. I, a novice at kayaking, was very apprehensive and daunted by the temperture of the water which I knew could quickly cause hypothermia, but our reassuring guide set me at ease and then surprised me by making me his partner in his own kayak. The eight of us put in on the flat rock inlet and pushed our crafts into the water, getting in carefully so as not to tip over. Then we had fun paddling in windmill style of rotation, which was easy to learn with our excellent teacher/guide. We went about two miles out into the river and stayed parallel to the shore, watching for animals, birds, and campers as we floated past. And then, to our delight, the minke whale pod appeared nearby. The guide told us to keep our kayaks in a group close together so the whales would see us as a barrier from below and not tip us over by surfacing in the wrong place. Whales have to surface to breath, as they are mammals too. We watched in awe as they dived and headed away from us. Just then a huge seal swam near us. That is when our guide said we must head in the opposite direction because seals can be aggressive. He had had a scare when he was kayaking alone at night, so he was keenly aware to be cautious. It was so fun to learn from him and he is an excellent, careful guide, certified in every kind of safety for water sports and handling emergencies. We loved every minute of our afternoon of exploration on the great St. Lawrence waterway. It is a trip you MUST make and one we’ll never forget!